May 26. We arise early for a sumptuous breakfast served by our adorable butler, Jariah, in our private pavilion overlooking the river with a backdrop of forest. Doesn’t get much better than this. There is ample food for ten, at least, and we’re all embarrassed by the waste and have told Jariah that we’d like to order a more modest breakfast tomorrow. We and the Lewises have already decided that we are going to adopt (or kidnap) Jariah and bring her back to the States. We are driven to the start of the canopy walk in which we are immersed in the forest and are able to see birds at their own level. The early morning mist gradually rises and the scene is quite magical. Azmil is an expert birder and finds many species that we would never have seen, often capturing them in his scope so that we can see them clearly. He is very pleased at the Bornean bristle-heads he finds, since they are rare and many serious birders come to Borneo largely to see them. 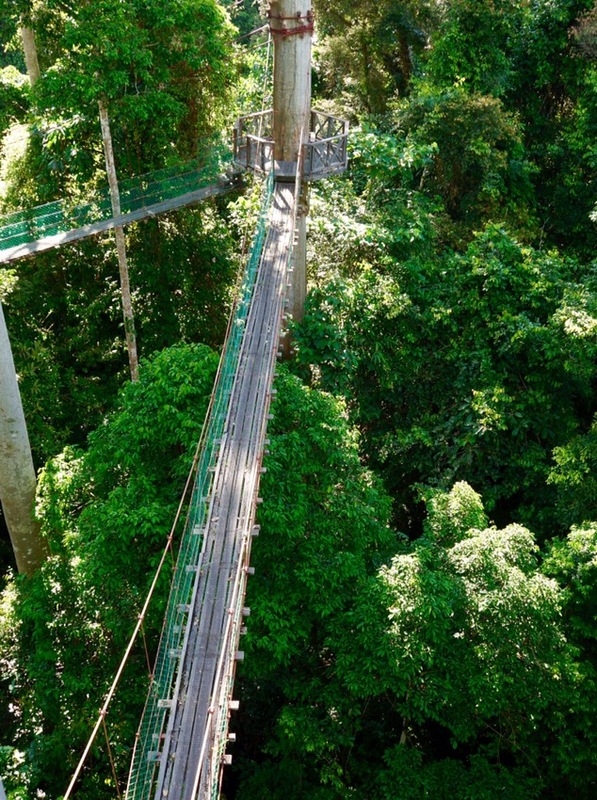 I am more impressed with the experience of walking at canopy level on suspended bridges through the forest than with the particular birds we see. I actually find it frustrating trying to find the birds in my binoculars, and they are too small and distant to photograph. This probably establishes that I’m not a hard-core birder. But it’s fun enough. And here’s our guide, Azmil After the canopy walk we run into two lodge guest who say that they saw orangutans by the lodge, which is very exciting. I tell them that I’m glad for them, which is a lie. I’m jealous. We drive back towards the lodge, hoping to be able to find the orangutans. 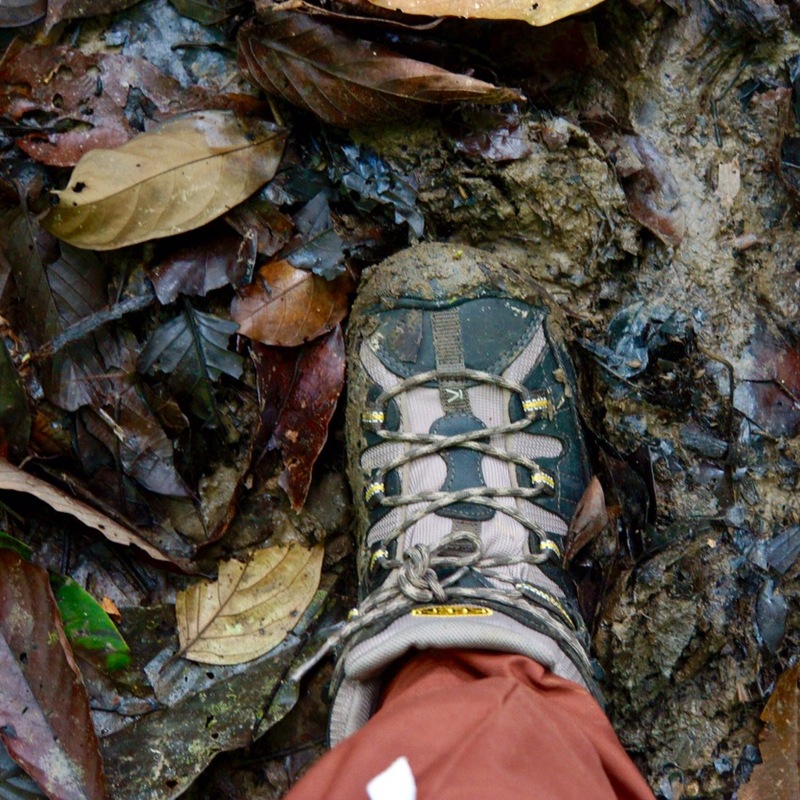 Azmil leads us onto a forest trail, which is quite muddy. This is good, because I bought new hiking boots and put them on for the first time today. This muddy trail makes it all worthwhile. God bless REI. 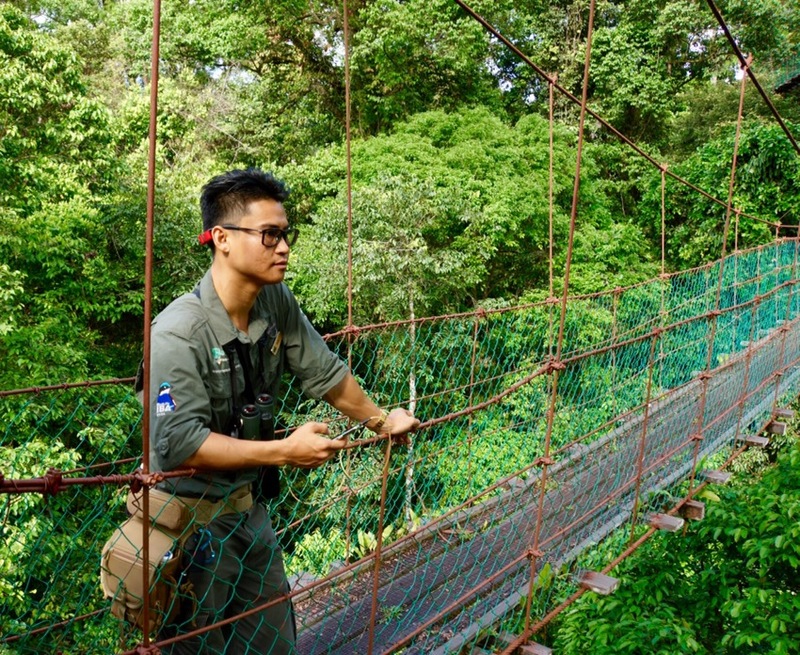 Azmil spots several more birds, a black squirrel and a macaque monkey, but no orangutans. 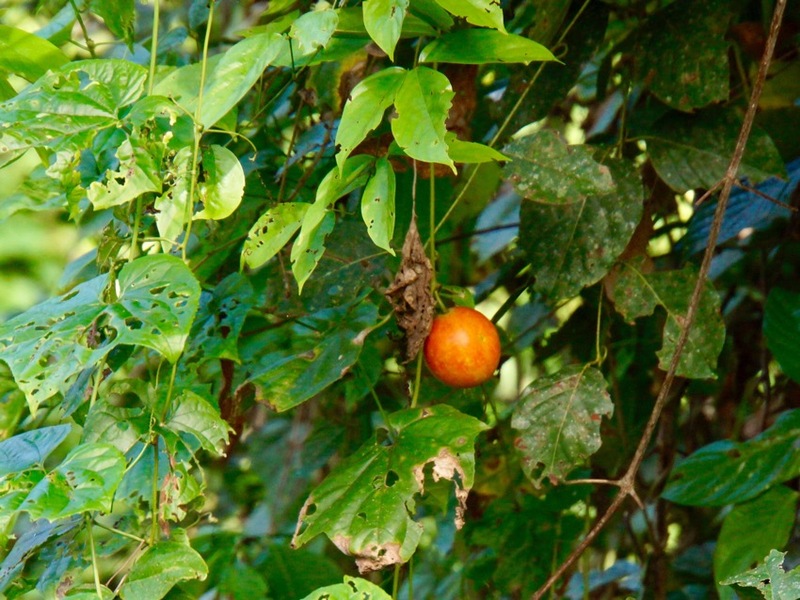 It’s impossible for me to photograph the birds in the forest, but I did get this excellent shot of a tomato-like fruit that held very still. Valerie and I also discover one leech, each. Actually, it’s more accurate to say that two leeches discover Valerie and me, one each. Jariah is waiting for us with cold drinks when we arrive back at our rooms and we sit and have the drinks in our private pavilion. A person could get used to butlers and private pavilions. Azmil tells us about the forest walk we’re doing at 3:30. We tell Azmil that we’re not doing no damn forest walk at 3:30 (actually, we put it a bit more nicely than that, since I was not the one to break the news to him). He tells us about a short night walk we’re going to do, but we tell him that we’d rather do a night walk to look for frogs, so we are going to do that. It’s 11AM, and we are hot, muddy and tired, so we go back to our rooms for outdoor showers and a change of clothes, before walking on the boardwalk to the main lodge at noon. The large buffet lunch is very nice, but way too much for me, so I get them to make me a not very good cheese and tomato sandwich. We retire to the room to rest and read. I spend a bit of time cooling off in our little pool on our deck, then Carol reads and I blog on our deck, sheltered from the heavy afternoon rain that would have required cancellation of our afternoon walk, in any case. So here’s some information about the Danum Valley Conservation Area, in which our lodge, which is owned by Sabah State, is located. The area shelters more than 270 species of birds and 109 species of mammals, including Asian elephants, orangutans, deer and Bornean rarities such as Sumatran rhinoceroses, clouded leopards, and the impressive Bulwer’s pheasants. 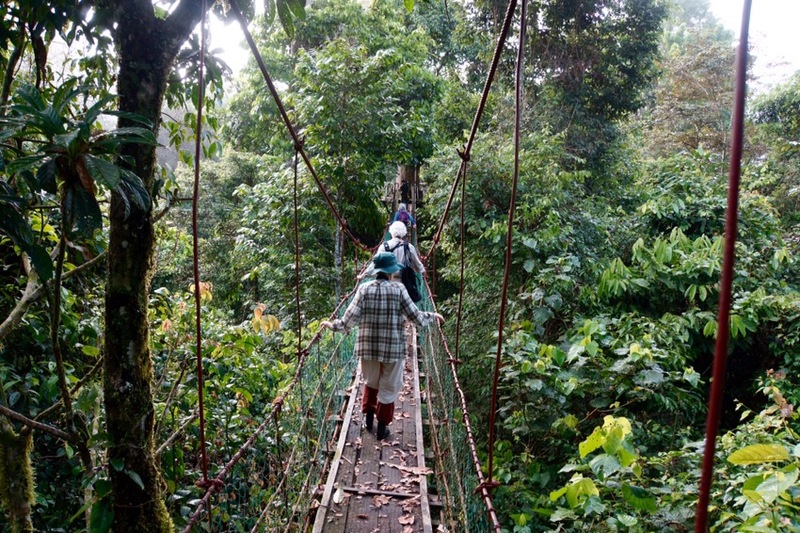 More than 100 miles of walking trails meander through the valley’s secondary rainforest. 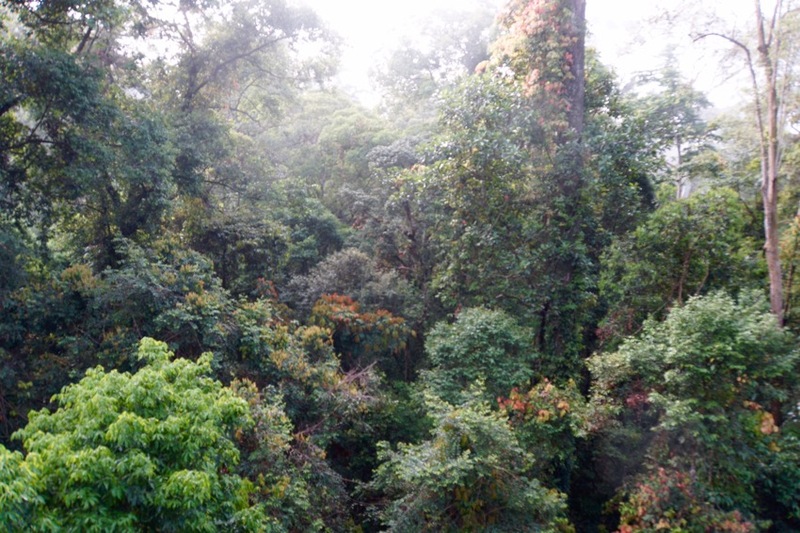 The Danum Valley also supports one of the largest remaining populations of wild orangutans, which, although difficult to spot, we have a decent chance of seeing under the guidance of Azmil. 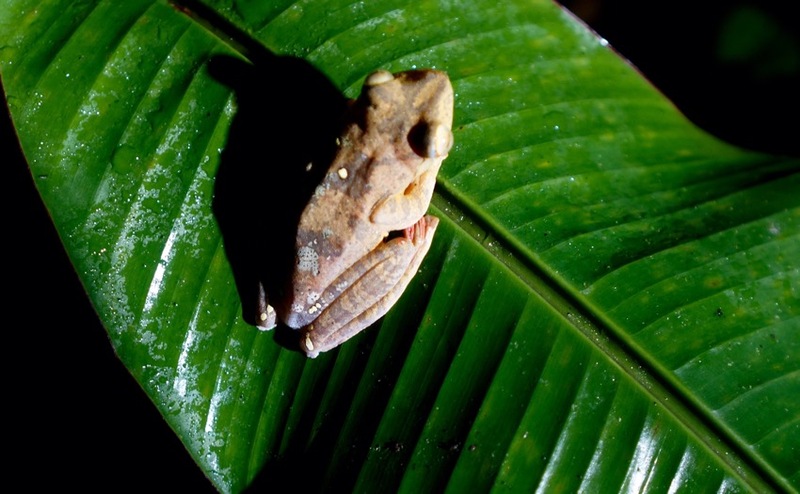 In spite of the diversity and large numbers of animals, most are extremely well camouflaged. 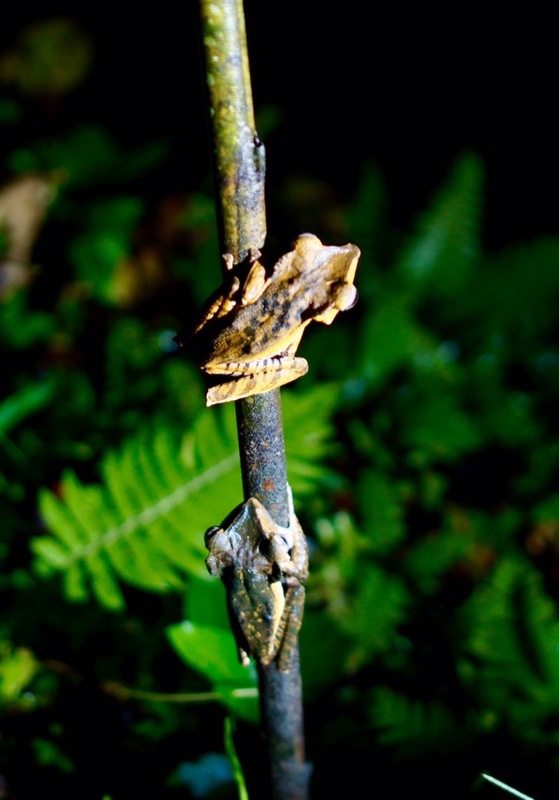 Easily visible, though, are an incredible diversity of flora and fauna, including some of the world’s largest butterflies and moths. After about 7 hours “off”, Azmil meets us at the room to lead us off on our frog walk. 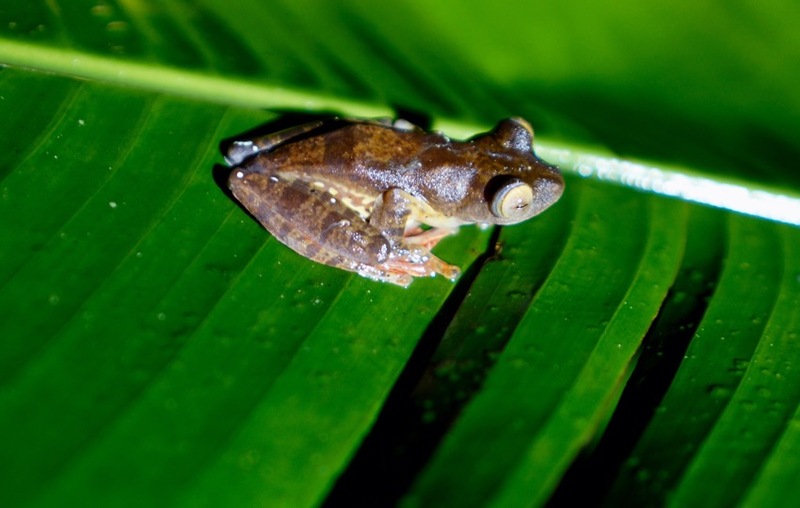 Ever since meeting with a Bob Inger at the Field Museum in Chicago, I’ve been totally up for seeing frogs. And we’re not disappointed, as we see five different species. To get to one of them we had to climb up a very muddy, slippery slope. Up was tough, but I think I’d still be up there with that frog were it not for Azmil’s help getting down. 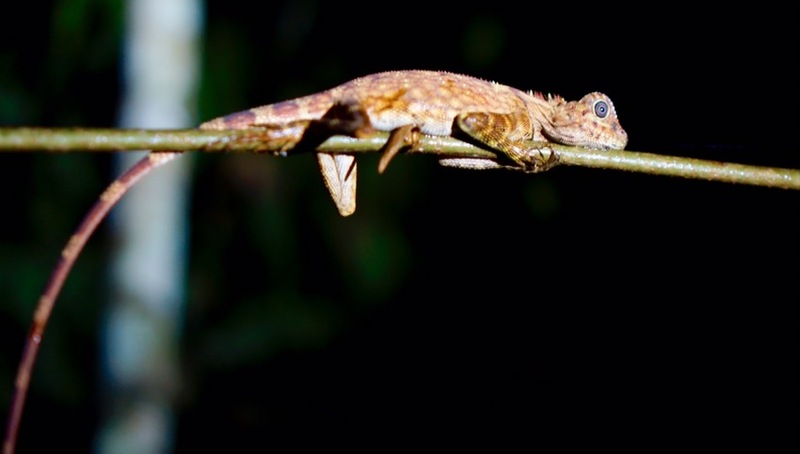 In addition to frogs, Azmil spots a lizard, and, amazingly, a slow loris (a type of cat) way the hell up in a tree. We return to our rooms, where dinner is served to us by Jariah outside in our pavilion by the river. Not too shabby. 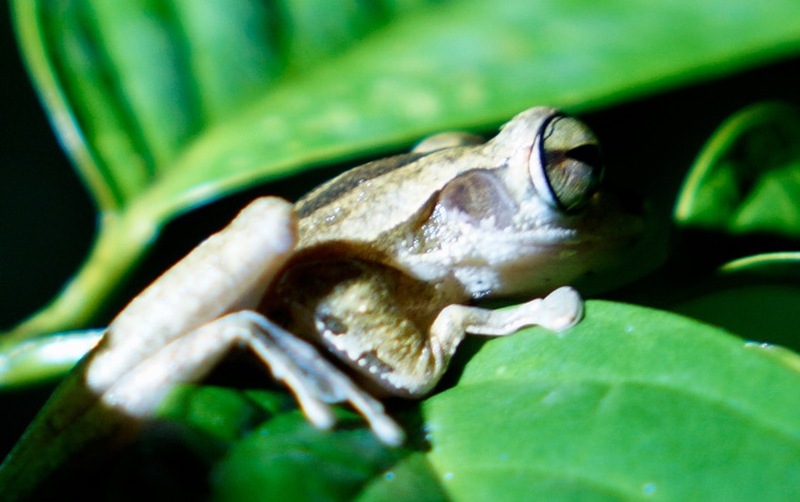 great frog shots, can you snap any butterflies, snakes, and spiders? all these sumptious buffets, what kinds of unusual foods are you ingesting?